From sprinting techniques to long-distance racing, javelin-throwing to long jump, hurdles to race-walking, kids will learn the building blocks of track and field. Each spring and fall free weekly instruction is offered at Thomas Jefferson Park in East Harlem in partnership with the Randall’s Island Park Alliance. Our program introduced novice runners to cross country distance running through runs from East Harlem to Randall’s Island Park. Along the way, participants learn to pace themselves, proper technique, and receive periodic talks on good nutrition and healthy living habits. Beginners are welcome. 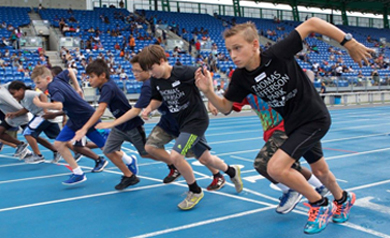 From sprinting techniques to long-distance racing, javelin-throwing to long jump, hurdles to race-walking our Track & Field free program offers kids a chance to learn the building blocks of the sport. From sprinting techniques to long-distance racing, javelin-throwing to long jump, hurdles to race-walking our Track & Field free program offers kids a chance to learn the building blocks of the sport in 13 neighborhood parks across the 5 boroughs. For more information on our Track & Field program, contact sports@cityparksfoundation.org or call (718) 760-6999. Generous private support is provided by the Stavros Niarchos Foundation, Randall’s Island Park Alliance, and the Aviation Development Council. Public support is provided by the New York City Council. In partnership with NYC Parks.